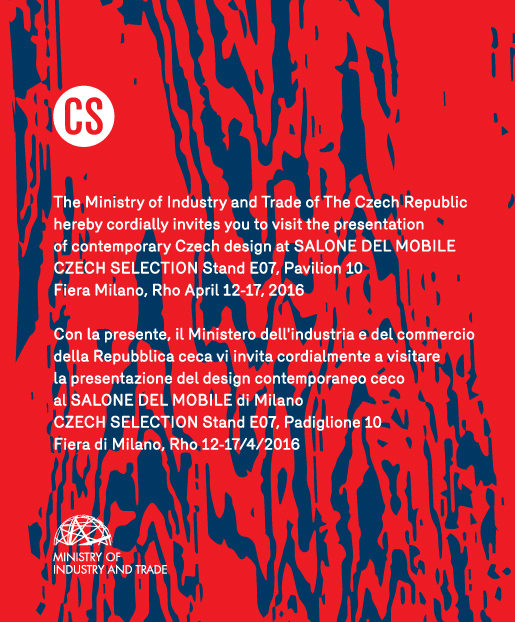 The Czech Selection exhibit at the Salone del Mobile 2016 introduces seven Czech companies which have founded their business on Czech materials, unique local craftsmanship and original design. Their products are used in residential, work and outside areas and are both functional as well as helpful for both physical comfort and psychological relaxation. Their products are inspiring and bring a desire to own them, touch them, enjoy them and live them. Contemporary design shares similar principles as contemporary art: it is full of references and memories, links to past experiences, well-known visual icons or common everyday things. These references then allow us to meet ourselves, share with others and find our place in the world. The Czech Selection includes the Paris table, with thin legs referencing the Paris towers; the Audrey collection of furniture for a lady's bedroom, which references to the film iconography of the fifties and the female beauty of Audrey Hepburn. The Bonbon side table made of silvered glass reminisces the packaging of sweets from our childhood. References are intertwined with the creation of furniture, here represented by four companies from various corners of the Czech Republic, and with interior accessories made especially from glass and porcelain, represented by three companies. The Brno-based A.M.O.S. DESIGN s. r. o. was founded after the velvet revolution in 1989 as one of the first companies specializing in the furnishing of working and private interiors. It remains active to this day and has gradually increased the quality of its designs over its thirty years of operation, as witnessed by the recent careful reconstruction of the Tugendhat Mies van der Rohe villa in Brno. The company was founded by the artist, performer and architect Vladimír Ambroz, for whom it means more than just an established business. His furniture designs are witty and have bold ideas. QC Floors s.r.o. is a company based near Prague which specializes in the processing of high-quality wood. The QC Paris table, designed by the Olgoj Chorchoj studio, represents an interesting combination of massive oak wood with cast iron in an elegant, original object with a strong visual as well as touching impression. The monumental luxurious table is prominent with its unobtrusive quality, solidity, lightweight robustness of materials and a pleasant human factor. The Hradec-Králové-based architect Helena Dařbujánová and her D.A.D. STUDIO s. r. o. have in the past years been systematically developing the area of lady's interior design, which was previously overlooked or forgotten to some extent. Their functional objects reference the traditions of modern furniture from the functionalism period and the fifties. That is why the romanticism of female boudoirs in Helena Dařbujánová's interiors is not as prominent, and only emphasized by whimsical colors and details. mmcité a. s., founded in 1994 in Zlín by David Karásek and Radek Hegmon, at that time fresh graduates of the Academy of Arts, Architecture and Design in Prague, has a very specific profile. During that time of reconstruction of Czech cities after a long period of socialist devastation, there was a clear lack of metropolitan equipment available on the market, and so mmcité specialized itself on this segment – from the design up to production – and in a few years managed to obtain several prominent international awards. mmcité introduces up to ten new items on the market per year, not only in the area of metropolitan equipment but also in the area of garden furniture under the egoé brand. BLOCQ benches by David Karásek can be varied using various modules and hence allow the creation of outside areas as a specific style of architecture. The oldest company represented in the Czech Selection is the MOSER glassworks from Karlovy Vary, which was founded by Ludwig Moser in 1857. From its beginning, the glassworks focused especially on luxurious and perfectly cut and engraved decorative items. It always worked with artistic personalities, including for instance Věra Lišková and Ludvika Smrčková, Adolf Matura, Pavel Hlava, who could utilize the palette of typical "Moser" colours. Jiří Šuhájek worked here as an internal artist, and his vases inspired by natural cycles form a part of today's latest collection. Art director Lukáš Jabůrek bet on a collaboration with artists from other areas. The biggest surprise could perhaps then be the collection of vases by fashion designer Beáta Rajská or the limited edition by Milan Knížák. This versatile artist, director of East Fluxus, performer, musician, and painter has also focused on the design of utility items already from the sixties; back then, these had a close correspondence with radical Italian design, notably with the work of Ettore Sottsass Jr. The latest collection by Knížák for Moser expands long-standing themes of his work as a designer, notably "softhard" and the "duo". The exclusive know-how of the craftsmanship tradition in the production of silvered glass, patented in the 19th century, was restored a few years ago by VERREUM s. r. o. thanks to a collaboration with Czech glassworks. The company has, under the art directorship of designer Sebastian Herkner, since 2014 collaborated with personalities of the international designer scene such as Arik Levy, Karim Rashid, Allain Gilles, Luca Nichetto and others. Items made of silvered glass liven up interiors thanks to their specious interplay of reflections and colours. The lovely young group of TABLO s. r. o. plans to bring new quality into tableware using simple but emotionally rich items. Experienced designers Gabriel Vlach, Antonín Tomášek and Jiří Novotný work with the magic of bohemian glass and porcelain in their basic qualities. Items made by TABLO have an encoded message, a story, and using them then quickly lets us create a personal relationship with the items on the table. The Czech Selection is also unique thanks to the work of the leading Czech designer studio Olgoj Chorchoj. Its founders, Jan Němeček and Michal Froněk, also operate as the leaders of Product Design Studio at the Academy of Arts, Architecture and Design in Prague and have already brought up a number of talented designers. The Czech Selection at Salone del mobile 2016 introduces a collection of contemporary approaches, original design and excellent execution based on local tradition. I rimandi penetrano sia nei mobili, qui presentati da quattro aziende provenienti da diversi luoghi della Repubblica Ceca, sia nei complementi d'arredo, soprattutto nelle creazioni di vetro e porcellana, esposte da tre aziende. L'azienda di Brno A.M.O.S DESIGN s.r.o. venne fondata dopo la cosiddetta Rivoluzione di velluto del 1989 come una delle prime aziende specializzate nell'arredamento d'interni lavorativi e privati. È attiva da quasi trent'anni, in un crescendo qualitativo testimoniato dalla recente e accurata ristrutturazione della villa Tugendhat Mies van der Rohe a Brno. L'azienda fu fondata dall'artista, performer e architetto Vladimír Ambroz e per lui rappresenta molto di più di un negozio ben avviato. Le sue proposte d'arredo sono idee audaci e spiritose. L'azienda QC Floors s.r.o., specializzata nella lavorazione del legno di alta qualità, ha la propria sede non lontano da Praga. Il tavolo QC Paris, disegnato dallo studio Olgoj Chorchoj, combina in modo interessante il massello di rovere con la ghisa, in un oggetto elegante e originale che colpisce sia la percezione visiva che tattile. Il tavolo lussuoso e monumentale attira l'attenzione per la sua qualità sobria, per la sua solidità, per la robustezza alleggerita dei materiali e per le dimensioni piacevolmente a misura d'uomo. L'architetto di Hradec Kralové Helena Dařbujánová e il suo D.A.D. STUDIO s.r.o. hanno sviluppato in modo sistematico negli ultimi anni il tema dell'arredamento d'interni femminile, che era stato perso di vista o dimenticato. I suoi oggetti funzionali rimandano alla tradizione dell'arredamento moderno del funzionalismo e degli anni cinquanta. Grazie a ciò, negli interni di Helena Dařbujánová, il romanticismo dei boudoir femminili è sobrio, viene messo in rilievo solo grazie ai colori suggestivi e ai dettagli. L'azienda mmcité a.s.,fondata a Zlín nel 1994 da David Karásek a Radek Hegmon, due neolaureati dell'Università di Arti Applicate di Praga, ha un profilo alquanto specifico. A quel tempo, durante la ricostruzione delle città ceche dopo il lungo periodo di devastazione socialista, mancava quasi totalmente l'arredo urbano nel quale l'azienda mmcité si è specializzata, dalla progettazione fino alla produzione, guadagnando nel giro di pochi anni importanti riconoscimenti internazionali. Ogni anno l'azienda mmcité introduce sul mercato fino a dieci nuovi prodotti, non solo nel campo dell'arredo urbano, ma anche nel settore dei mobili da giardino con il marchio egoé. La panca BLOCQ di David Karásek può essere variata in base a diversi moduli, plasmando lo spazio esterno come un'architettura unica nel suo genere. L'azienda più antica, rappresentata dal gruppo di espositori Czech Selection, è la vetreria MOSER di Karlovy Vary, fondata nel 1857 da Ludwig Moser. Sin dall'inizio l'azienda si è concentrata soprattutto sull'impeccabile produzione artigianale di oggetti decorativi di lusso cesellati e intagliati. Ha sempre collaborato con artisti come Věra Lišková e Ludvika Smrčková, Adolf Matura, Pavel Hlava, i quali sono stati in grado di mettere in gioco la tavolozza dei tipici "colori di Moser". Qui ha lavorato come artista figurativo Jiří Šuhájek, i cui vasi ispirati ai cicli della natura, fanno parte dell'attuale e nuovissima collezione. In questa collezione il direttore artistico Lukáš Jabůrek ha scommesso sulla collaborazione con artisti figurativi provenienti da campi diversi. La sorpresa più grande è rappresentata dall'insieme di vasi della stilista Beáta Rajská oppure dall'edizione limitata di Milan Knížák. Questo artista a tutto tondo, direttore dell'East Fluxus, performer, musicista, pittore, si è dedicato anche con intensità, a partire dagli anni sessanta, a progetti di oggetti d'uso che all'epoca corrispondevano al "Radical design" italiano, collegandosi specialmente all'opera di Ettore Sottsass jr. L'attuale collezione di Knížák per Moser sviluppa i temi "softhard" e "duo", ricorrenti nella sua opera di design. Grazie alla collaborazione con le vetrerie ceche, l'impresa VERREUM s. r. o.,ha ripreso da qualche anno l'esclusivo know-how della tradizione artigiana nella produzione manuale del vetro argentato, patentato nel XIX secolo. Dal 2014, sotto la direzione artistica del designer Sebastian Herkner, l'impresa collabora con personalità del design internazionale come Arik Levy, Karim Rashid, Allain Gilles, Luca Nichetto e altri. Gli oggetti di vetro argentato animano gli interni grazie a un astuto gioco di colori e di riflessi specchiati. Il simpatico e giovane gruppo TABLO s. r. o. vuole portare in tavola una ventata di novità, grazie a una serie di oggetti semplici, ma altamente emotivi. Gabriel Vlach, Antonín Tomášek e Jiří Novotný, designer esperti, lavorano con la magia del vetro ceco e della porcellana, nelle loro qualità di base. Gli oggetti del marchio TABLO hanno un messaggio cifrato, un racconto, ed è grazie a ciò che, mentre li utilizziamo, instauriamo un rapporto personale con gli oggetti sul tavolo. Il gruppo espositivo Czech Selection si distingue per l'installazione, curata dall'importante studio ceco di design Olgoj Chorchoj, i cui fondatori Michal Froněk e Jan Němeček dirigono al tempo stesso anche l'Atelier di design della prestigiosa Università di Arti Applicate, Architettura e Design di Praga e hanno già formato una schiera di designer di talento. Il gruppo espositivo Czech Selection presenta al Salone del mobile 2016 una collezione caratterizzata da un approccio contemporaneo, da un design originale e da un'esecuzione eccellente, sulla base delle tradizioni locali.